Hello! Welcome to my new space! I apologize for the lack of posting the last few weeks; I’ve been working on changes that I wanted to make here, and I hope that it’s easier and more functional for you to use. I still have a few bugs to iron out, but I’m so excited to have a space that is clean and easy to navigate. Are there specific things you’d like to see here? Topics you want covering? Summer is such an easy time to eat well. 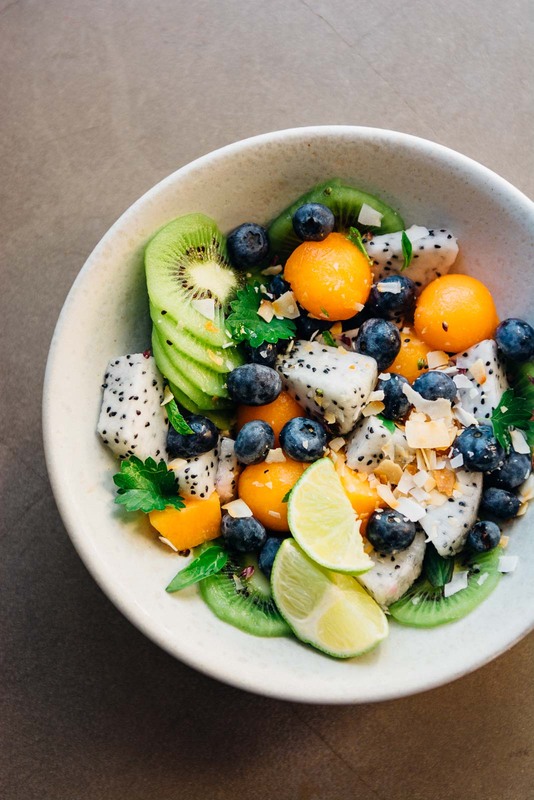 All it takes is some fresh fruit, a few herbs, and a simple dressing and you can enjoy this summer tropical fruit bowl ready in minutes. I have been on the road a lot this summer and it is a challenge to stay healthy when not at home. I do find myself eating a lot more junk when I travel and now that I’m home I’m really craving fresh fruit and vegetables. I’ve shared a lot of ways to enjoy fruit with you. I’ve shared ways to roast it, blend it, and bake it but realize that I’ve never shared a version for my favorite way to eat breakfast. 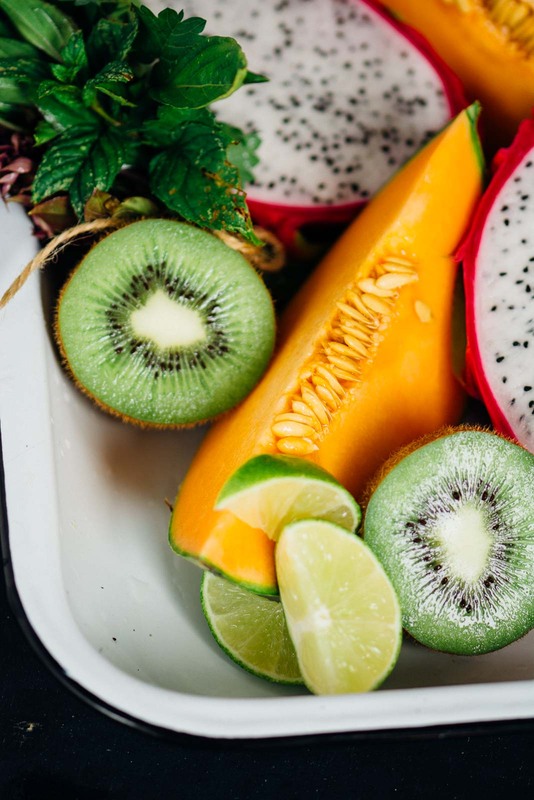 I love to load a variety of fruit into a big bowl, top it with something a little sweet, a little crunchy and a few fresh herbs for punch. 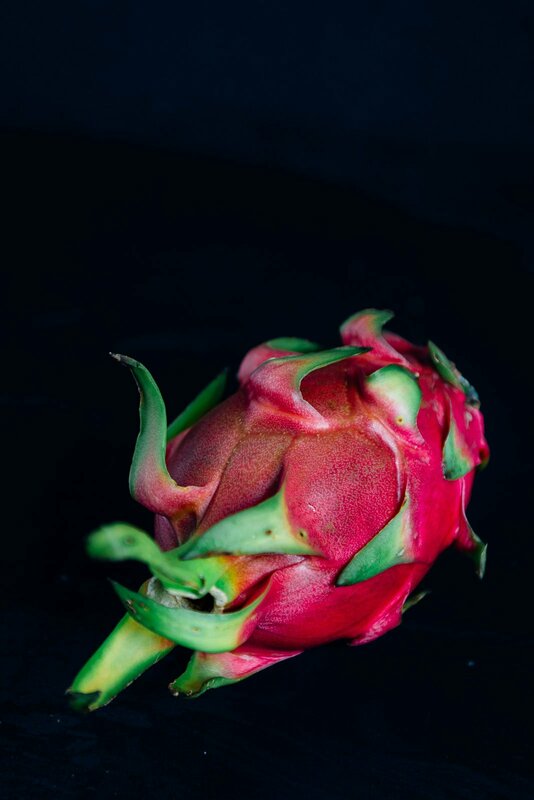 Have you ever tried a dragonfruit? I have a large Asian market close to my house and I love wandering the produce aisle looking for new tastes to experiment with. Dragonfruit is actually a type of cactus that is full of vitamin C, calcium, fiber, and antioxidants. Look for a fruit that has a bright even skin and should give a little when you press into the flesh but not be mushy. To get the fruit out you just need to cut it in half through the middle and then run a spoon along the outside of the flesh, it should come out easily in one piece. The taste of a dragonfruit is reminiscent of a kiwi but a bit milder. I found that I needed to pair it with something with a stronger flavor to enjoy it. 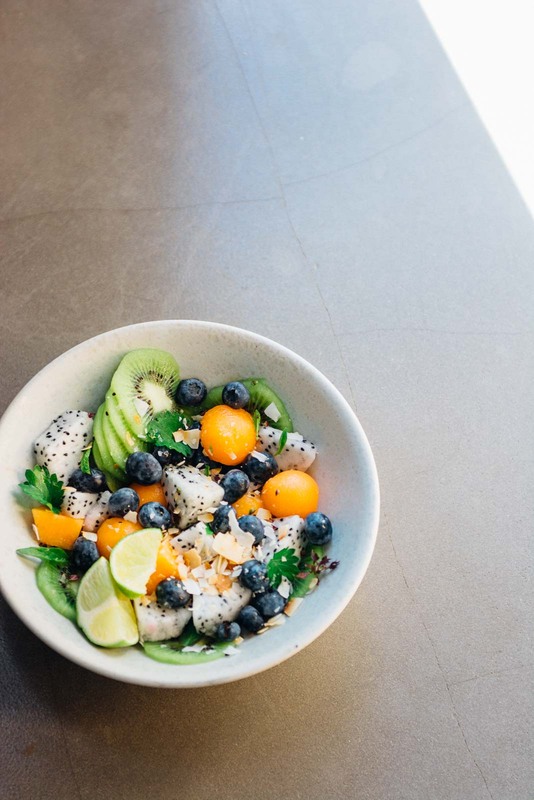 This bowl is really about the dressing, honey, lime, mint, ginger and some fresh herbs and it makes any fruit into something memorable. 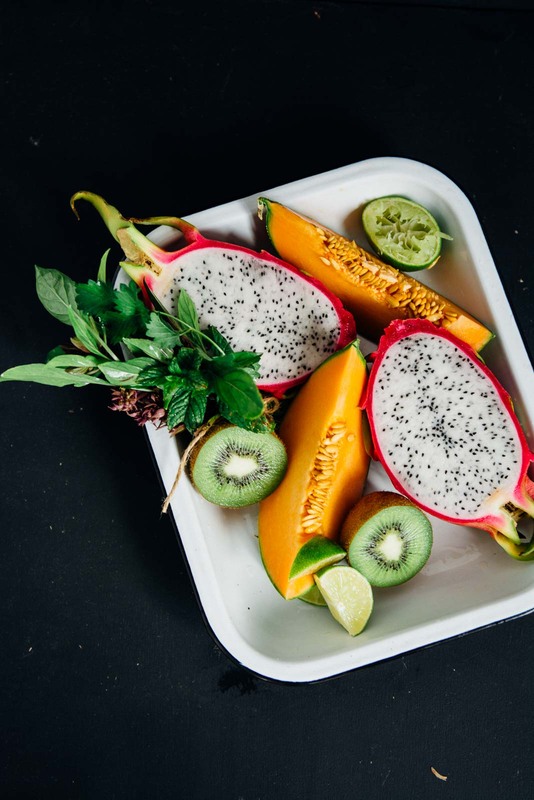 If you can’t find a dragonfruit don’t worry, to keep with the tropical theme, mango, pineapple or papaya would all be great substitutions. You could also consider adding some roasted cashews or pistachios for a bit of extra texture and crunch. I have been enjoying a version of this all week for breakfast and find that it sets me up to eat healthy all day. If you give this recipe a try, I’d love to hear what you think! Leave a comment, rate it, and don’t forget to tag a picture #scalingback on Instagram so I can see what you came up with! 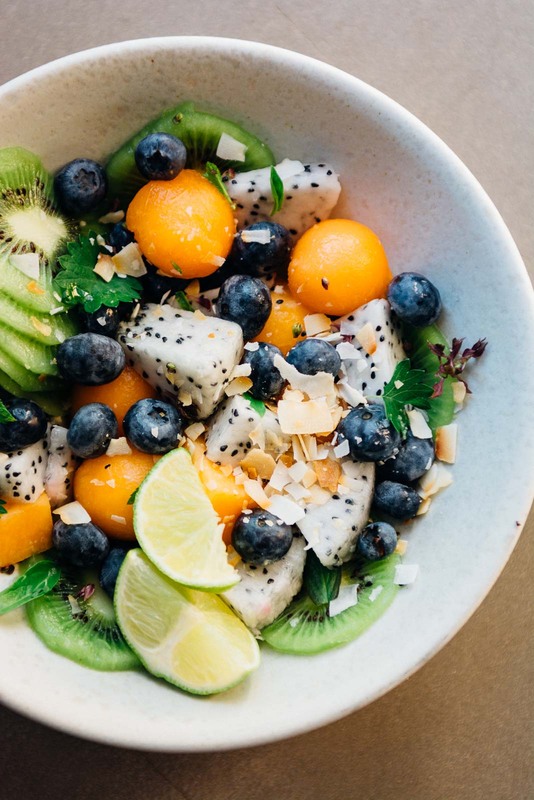 This summer tropical fruit bowl is loaded with dragonfruit, cantaloupe, blueberries, kiwi and topped off with an easy honey, ginger and lime dressing! In a small bowl combine the honey, lime juice, ginger and stir well to combine. Cut the dragonfruit in half and use a spoon to remove the flesh from the skin. Cut the dragonfruit into 1-inch pieces. 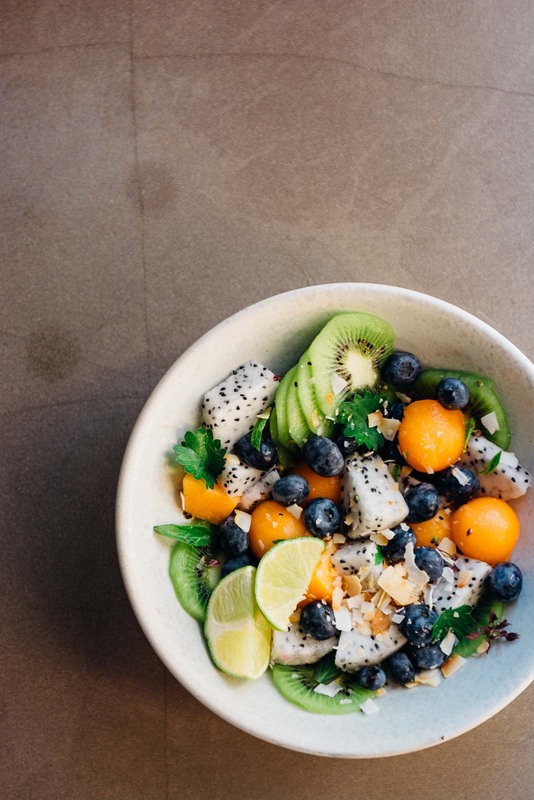 Add all the fruit to a large bowl, pour the dressing over the top and stir gently to combine. 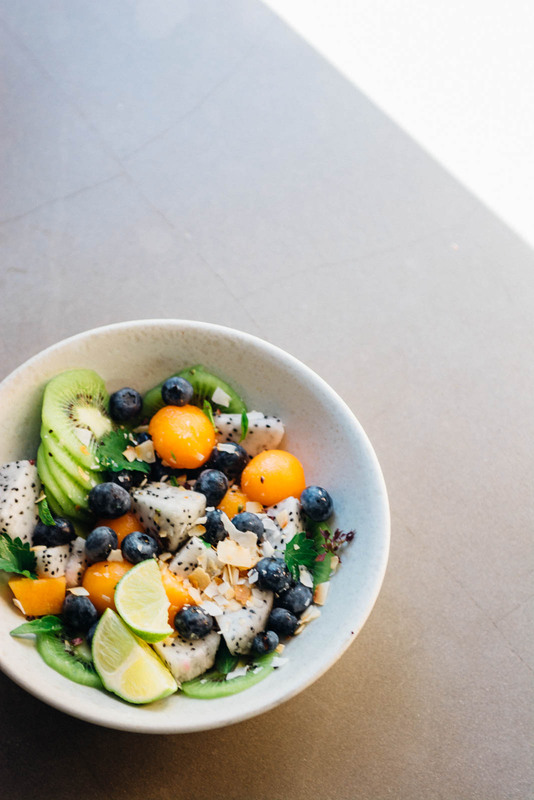 Serve with a sprinkle of toasted coconut and additional lime wedges.